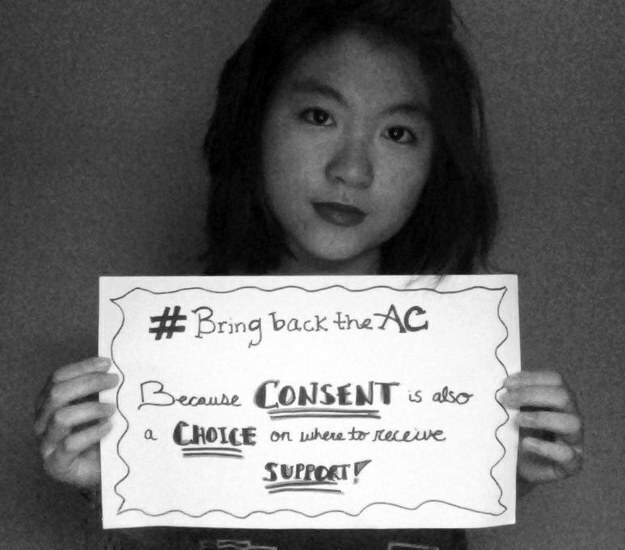 Within hours of being notified that the Syracuse University would be swiftly closing the Advocacy Center, an institution that provides crucial services for victims and survivors of interpersonal violence, students launched a campaign to stop the changes and #BringBackTheAC. In just a few days, a change.org petition had accumulated thousands of signatures. A few days later, activists launched a photo campaign that was covered by Buzzfeed. Word about--and support for--the campaign has continued to grow. Fact sheet: Centralize resources, not decentralize them. Response: Centralizing resources means more than just the placement of advocacy services. The alignment of advocacy, prevention, and education in one space is what creates such an effective community for survivors and allies. Physically separating survivors, only results in further stigmatization; conversely being welcomed into a community that is supportive, and non-judgmental, provides a unique space for healing and empowerment. Fact sheet: Provide clear direction on how students can access privileged and confidential resources to protect their rights. Response: YES. Please provide clear and sustained information about how this is possible through multiple resources to current and new students. Survivors should be able to make an informed decision as to what resource to access and what is right for them, whether that is the AC or not. Fact sheet: Privileged and confidential are not the same. Response: Privileged site: Reports no information. Confidential site: Reports no identifying information. Only the nature of the assault, date, time, and general location are reported. The survivor works with an advocate to decide what makes this information non identifiable. This could be as vague as a sexual assault occurred on X day, at Y time, on campus. Pros of having both: Empowers survivors to choose. Allows the University to better understand the prevalence of sexual assault occurring in our community. Cons of having ONLY one: Does not give survivors the choice of how they need to heal. Potentially results in a lower number of reported sexual assaults on the Clery Act Campus Security Report. While we know that the number of reported assaults does not necessarily reflect the true number of assaults occurring, higher numbers indicate that students are accessing resources, and feel comfortable and safe to do so. Without honestly and openly addressing an issue, how can we effectively solve it? Unanswered question: Why can’t the Advocacy Center be privileged? Fact sheet: Given the recent federal guidelines, confidential does not go far enough to protect students who want all information about an incident to remain completely confidential. Response: Under the new guidelines (p 3 of the White House Task Force Report), the Advocacy Center is a confidential site, and not mandated to share identifying information. Instead, information such as date, general location and nature of the assault will be reported, but after a survivor decides what makes the information identifiable. Again, this goes back to returning power, control, and choice back to a survivor. Having more than one option for survivors gives them a choice, gives them strength, promotes safety, and better protects students. Fact sheet: Many students, staff, faculty, survivors and allies voices were heard. Response: Many, many, many more were NOT heard. Confusions about the services offered by both the Counseling Center and The Advocacy Center, were due to poor institutional messaging after changes were made to The Advocacy Center in Fall 2013. A lack of knowledge about services is not substantial justification for the elimination of a resource. Additionally, the very first recommendation under the new guidelines is the campus climate survey research, which SU will voluntarily conduct. Why make this change BEFORE the survey? Fact sheet: Survivors have been utilizing the Counseling Center for sexual assault services. Response: Survivors, as per the fact sheet, have been using the Advocacy Center and the Counseling Center in equal numbers. This clearly indicates that BOTH resources are needed. It is important to note that both resources refer students to each other. Unanswered Questions: Both resources see students who have been affected by childhood sexual abuse, sexual violence, and relationship violence. Where are the students who are more recently affected by sexual and relationship violence going? Our campus is home to many international students, some non-American cultural and social norms might make some students reluctant to access a resource like the Counseling Center. What resources are more likely to be accessed by an international student? Fact sheet: Two new staff positions will be created at the Counseling Center to focus specifically on sexual assault and relationship violence. There will be no interruption in services to students, and the University will continue to offer dedicated advocacy for survivors of sexual assault and relationship violence on campus. Response: While it is encouraging to see that there will be positions with a specific focus on sexual assault and relationship violence, our paramount concern is that advocacy services are of the highest quality . We are extremely concerned that the University will be losing invaluable experience and knowledge with the dissolution of the Advocacy Center, a long-standing student resource. Fact sheet: Changes are in line with guidelines and best practices published in the White House Task Force report. Response: Based on research and recent changes around the country, best practices dictate a centralized resource in the model of victims’ advocacy; a space where advocacy, prevention, and education are all located in the same space. “Schools should identify trained, confidential victim advocates who can provide emergency and ongoing support. This is a key ‘best practice.’ The person a victim talks to first is often the most important.” SU needs to conduct thorough research surveys about who these advocates should be, so that students feel encouraged and comfortable seeking them as resources. If “key stakeholders, including students, survivors, peer educators, campus security, etc., will be brought together to review [the] Sexual Misconduct Policy in the coming months," we also believe that a similar approach to reviewing changes to support services and primary prevention needs to be taken.